An executive order pulled close to 6,000 unvaccinated children out of schools. Nearly 17,000 doses of the measles-mumps-rubella (MMR) vaccine were given in 26 weeks. There was a public health campaign in which community officials, doctors and rabbis testified to the importance of immunisations. 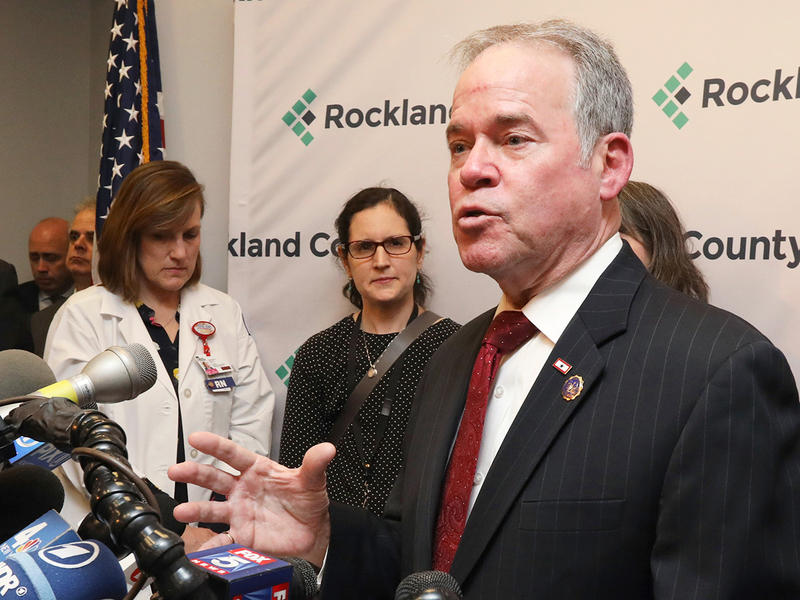 Day said he believed Rockland County’s order was the first of its kind in the United States, and several public health experts said that they could not recall any action like it in recent years. The outbreak has been largely concentrated in ultra-Orthodox Jewish communities in Rockland, many of which have close ties to Brooklyn areas where there have also been infections. In both communities, vaccination rates tend to be lower, and anti-vaccination literature has spread, public officials have said. The declaration highlighted the desperation of public officials to control the spread of a disease they have so far struggled to halt. Measles was proclaimed eliminated in the United States in 2000, but a handful of outbreaks have spread in recent years. There have been 314 confirmed measles cases in the United States in 2019, as of March 21, according to the Centers for Disease Control and Prevention. In addition to New York, there have also been recent measles outbreaks (three or more cases) in Washington state, Texas, Illinois and California, the CDC said. “I think this is a measure that would highlight the stakes of measles and that would put a stop to these outbreaks,” said Jason L. Schwartz, a professor of health policy and the history of medicine at the Yale School of Public Health. While Rockland County’s health department has made strides in increasing the vaccination rate, so far, only 72.9 per cent of people in the county between the ages of 1 and 18 are vaccinated, Day said. As county officials tried to trace the outbreak, they were dismissed by some members of the community who refused to answer questions and even hung up the phone, Day said. Day cited this behaviour, which he called shockingly irresponsible, as justification for his order. In December, Rockland County issued exclusion orders barring unvaccinated children from schools with low vaccination rates. In New York City, health officials also issued an emergency order requiring that schools in certain ZIP codes block unvaccinated students from attending class. But as public health officials in Rockland County worked to contain the outbreak, they also found possible instances of measles exposure in supermarkets, stores and shopping centers. On Thursday, the county’s health department warned of possible exposure this month at a Target in Spring Valley, a village of more than 30,000 people. The order barring unvaccinated minors from public places will take effect at midnight on Tuesday and expires in 30 days. Included in the ban are restaurants, schools, shopping centers and places of worship. Schwartz said it has been common for decades to exclude unvaccinated children from schools during outbreaks. He said policies like Rockland County’s are a “logical extension” of that practice. “When you’re thinking about ways to limit the ability of measles to circulate among the unvaccinated, it makes sense,” Schwartz said. “They’re taking all these susceptible kids and taking them out of circulation, in effect,” he said. Officials are particularly worried because measles is among the most contagious of the infectious diseases. The virus can live for up to two hours in the airspace where an infected person has breathed, coughed or sneezed, and up to 90 per cent of nonimmunized people who are exposed to the virus will also become infected, according to the CDC. The MMR vaccine, when given in two doses, is about 97 per cent effective against measles. Rockland County officials, Day said, do not plan on “chasing people down” and asking for proof that they are vaccinated. The prohibition will be enforced retroactively, with parents facing up to six months in jail or a fine of up to $500, or both, if they are found to have allowed unvaccinated children in public spaces. Rabbi Yakov Horowitz, the founding dean of Yeshiva Darchei Noam in Monsey, New York, a community at the center of Rockland County’s measles outbreak, said he strongly supports vaccinations, but he is worried that the county’s declaration might lead to potential harassment, attacks and discrimination against ultra-Orthodox Jews. Some public health law experts also expressed concern that the county’s order could infringe on civil liberties. “This is virtually imprisonment of a child, and certainly significantly restricting the child’s liberty,” Gostin said. Because public health officials are given broad powers to deal with public health emergencies, it is important that they use them in ways that are not counterproductive, said Wendy E. Parmet, a professor of health policy and law at Northeastern University. Still, without knowing all the specifics of Rockland County’s outbreak and the government response, she was hesitant to weigh in on the order’s constitutionality.